Thank you for choosing Dazzle Expressions! This listing is for a digital file you can print from anywhere. We'll do all the custom design work for you to give you an effortless and smooth experience. Please read the entire description below prior to completing your order and contact us with any questions. Thank you! Tell your guests thank you with this adorable card that includes a photo of your child! (Can also be made without a photo if you'd like.) Wording can be customized. This listing is for digital files only which will be sent to you via email. Your files will be sent to the address you provide when checking out. You will not receive anything by mail. The files will be sent within 24-48 hours. 1. 4x6, 5x7, 6x7 (Costco Greeting Card) or 2 invitations to an 8.5"x11" PDF file. *NOTE* Be Sure to add our e-mail address to your "safe senders" list. If you do not receive your invitation after checking your spam folder in our 24-48 hour turnaround time then please contact us right away. 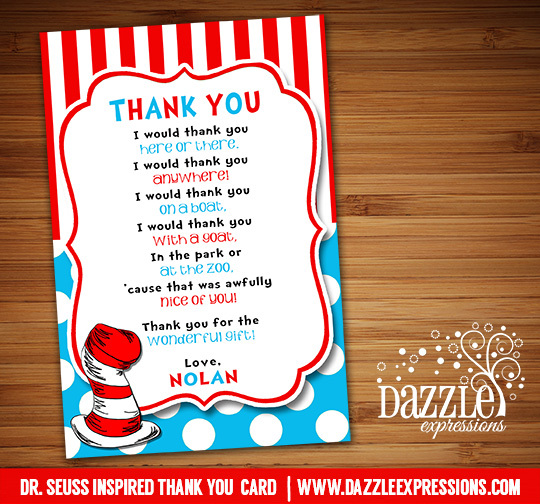 You will receive the thank you card in 300 dpi high resolution jpeg format. You can print on your home computer or upload your invitation to any photo lab or printing place. PDF files cannot be printed at a photo lab, but can be printed somewhere like Staples, Office Max, FedEx Office, etc. You will receive a proof of your design within 24-48 hours. If you need it within 12 hours it is an extra $5 charge (listing is above). I will send the proof to your e-mail address that you leave when you checkout. You will then have the opportunity to look over your proof and request any changes or approve it. Thank you for choosing Dazzle Expressions! ©2019 Dazzle Expressions. All rights reserved.